It’s the easiest response, and it’s the most positive. But it’s probably not entirely true. No one wants to hear about how some weeks are harder than others and that life can still go wrong while you’re here. Those confessions aren’t as fun as stories of sitting on Shakespeare’s bed or trying wild boar. But rough days (or weeks) happen. I felt like nothing went right this week. Every day something completely unplanned went wrong and managed to upset me more than I wanted it to. Of course, they weren’t major crises. It’s those little things that add up, like a broken washing machine, a shattered glass ring from Venice (that I dropped after one wear) and my arm getting very bruised after I clumsily tripped down the escalator on my way to the tube. And when you’re abroad, it’s hard to go for a spontaneous pick-me-up ice cream run and even harder to call your family and friends to cheer you up, so you have to figure out what you can do to make yourself feel better. Even in America, the person you want to talk to most might’ve forgotten her cell phone and can’t pick up, or you might not have any cash to spend on a cheer-up cupcake. But you have to keep going. 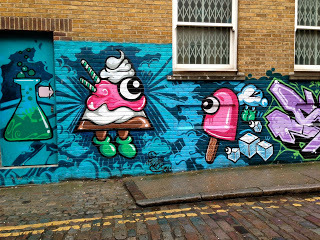 On Thursday I went on a street art tour around East London’s Brick Lane and saw hundreds of illegal masterpieces. Street art is technically vandalism, but our professor explained that street artists wouldn’t be punished because they add value to the area. 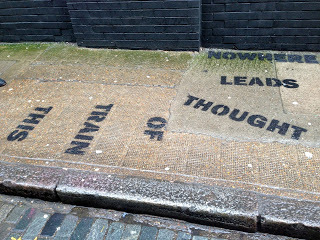 It’s actually thanks to street art that the area surrounding Brick Lane became financially stable. Just 10 years ago the area was barren and “sketchy.” Now, it’s inundated with hipsters shops where vendors sell trendy clothes, vegan meals and fair trade items. 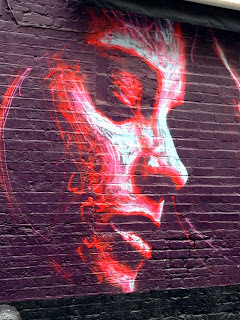 Thanks to these unconventional artists, drab brick walls become colorful works of art overnight. The scene is constantly evolving. Street artists paint over one another’s work after just a few days or even hours, so the changing landscape helps to draw people to the area. Even hipsters admit that they like street art, so the universal appeal is undeniable. I got to see original works by Banksy, a famous street artist who works in the night. He’s a political activist, film director, painter, and also a very sarcastic and irreverent guy who uses dark humor in a lot of his pieces. 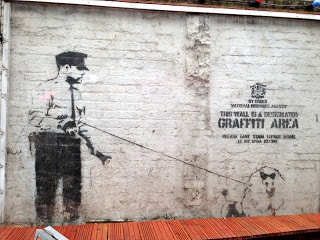 His works are much loved and admired by people worldwide, but Banksy is famous because no one knows who he is. Somehow, this incognito artiste placed fake works in the Museums of Modern Art, Metropolitan Art, and Natural History in New York. 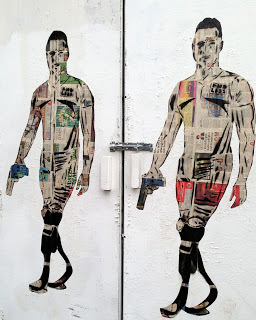 Banksy is great, but my favorite street artist is Stik, who paints solitary cartoon figures. Besides the fact that I love animated figures, I love Stik because of his message. His characters symbolize how London can feel lonely even though it’s filled with 8 million people. I’ll be your friend, little guy! 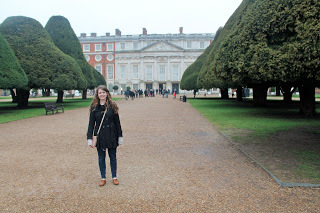 On Saturday, Jessica and I pretended to be royalty as we traveled to Hampton Court Palace, which was once home to the callous womanizer King Henry VIII. 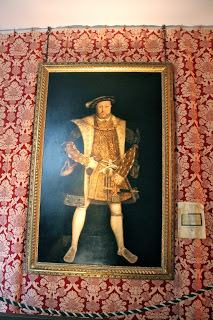 I’ve always been interested in King Henry VIII, but it’s mainly because of the number of wives he had. Watching The Other Boleyn Girl has made me incredibly sympathetic to Anne and Mary Boleyn, even if the story is historical fiction. Although I have yet to read the book, I loved the movie (and not just because my favorite celebrity crush of all time is in it). 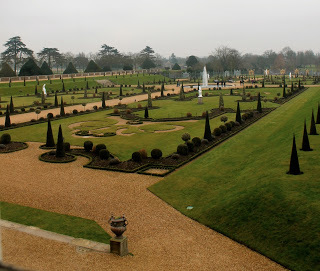 The palace is a 30-minute train ride outside of the center of London. It’s incredibly big, which fits Henry’s massive ego. There’s enough room for all of his six wives to live inside at once and never see one another, although they obviously lived there at separate times. 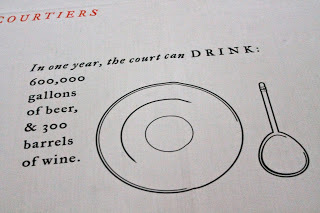 We first toured the kitchens, where servants once made enough food for 600 people. 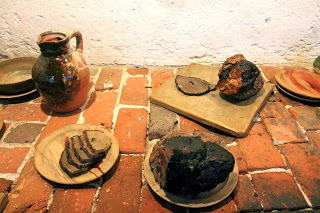 The Tudors ate the ultimate “man meals” with meat comprising 75% of their diets. 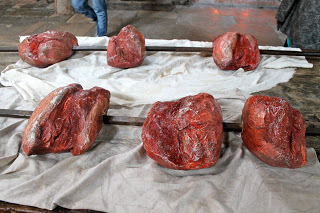 Meat was a status symbol, so the wealthier you were, the more meat you ate. The kitchen actually had an administrative office where one person would keep track of all of the meat orders and meal plans for the day. 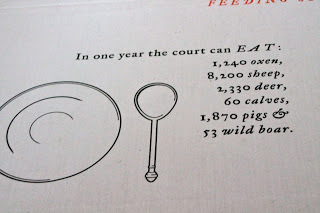 Tudors ate 4,000-5,000 calories each day, so they definitely enjoyed their protein! 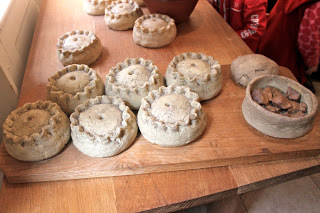 Pies were used instead of pans. No one actually ate them! We went to Henry’s apartments next, where we saw rooms that he dedicated to each of his brides. Awkwardly enough, these rooms stayed open after he remarried. I guess his brides knew what was coming when they married him, and knew that at the very least they would get a beautiful, ornate room dedicated to them. Henry VIII was self-important and when he didn’t like the rules, he changed them (remember that whole Church of England scandal? That was because of this guy). He desperately wanted a son to succeed him, but his first two children were daughters. 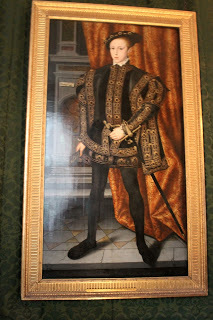 Eventually, Edward VI was born. He took the throne when he was only nine, but died when he was 15. 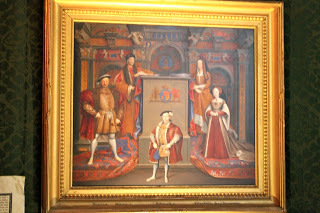 The first King to be painted standing up, so he looked imposing. Interestingly enough, all of Henry’s kids got to save their turn on the throne. Mary was queen for five years but largely disliked. She’s actually the “Bloody Mary” from the scary folklore tale who will appear in the mirror if you whisper her name in the dark. After she took the throne, she killed all of the church officials whom her dad appointed in the Church of England because she was Catholic. Elizabeth was last and was queen for 45. 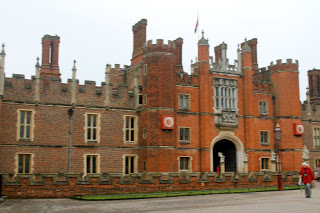 She was largely admired and never married, thus ending the Tudor dynasty. 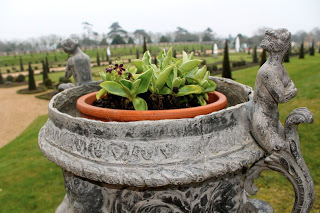 Hampton Court Palace is full of amazing gardens. 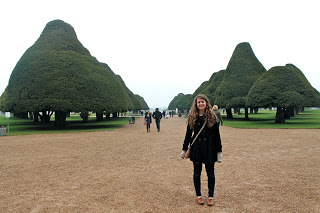 I decided that if I were ever Queen, I would be known for taking breaks for daily garden walks. 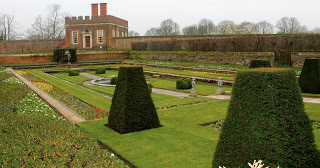 Ok if I can’t live in the palace can I live in the garden? 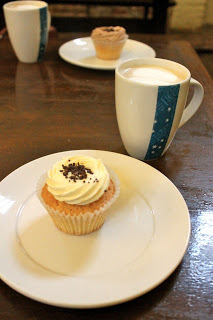 To finish our visit, Jessica and I decided to warm up with coffee and a cupcake. Because he loved food, it’s what King Henry VIII would’ve wanted. So yes, my washer is still broken and my arm is bruised, but I’m not one of King Henry VIII’s wives, so things are still looking up.